Get Pumped! IDF® CHiKPRO™ Chicken Protein Isolate Powder Debuts at the Arnold Sports Festival! 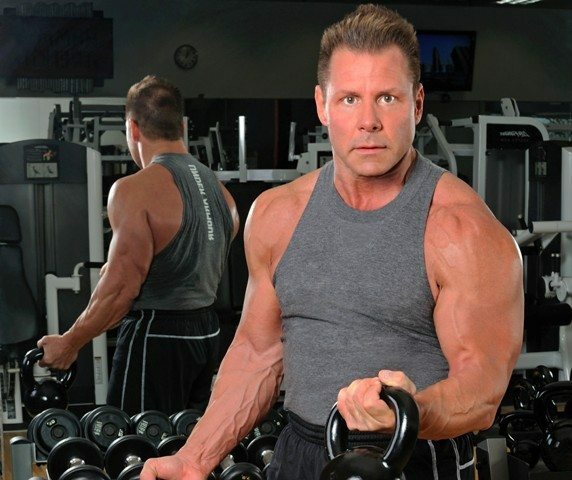 As an IFBB professional bodybuilder, supplement expert, and world-class trainer, I’ve been going to Arnold Schwarzenegger’s annual bodybuilding and fitness event for thirty years. But I’ve never been more excited about it than I was in 2016. This is the year we brought the people new IDF® CHiKPRO™ Chicken Protein Isolate Powder! What began as a one-day professional bodybuilding competition in Columbus, Ohio nearly three decades ago has grown into the world’s largest multi-sport fitness weekend, with four days of sports competitions, demonstrations, seminars, entertainment, and the latest fitness products—this year including IDF’s new, game-changing supplement ingredient: CHiKPRO™ Chicken Protein Isolate Powder, coming soon to your favorite supplement brands! 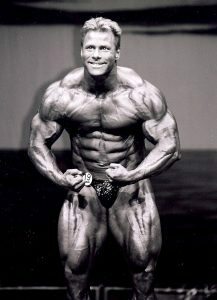 After my win at the 1985 Mr. World contest in London, Arnold and promoter Jim Lorimer invited me to compete in their 1986 Mr. World competition. That event, now known as the Arnold Classic, today draws more than 200,000 attendees to watch 18,000 athletes in 70 sports and events celebrating health and fitness. In addition to 14 Olympic sports, eight IFBB Pro League contests, the Arnold Strongman Classic, and the world-famous Arnold Amateur Championships, “the Arnold” hosts the largest fitness and nutrition consumer show, where top brands and ingredient companies showcase their latest nutritional innovations for the industry. That’s where CHiK|PRO™ comes in! New IDF® CHiKPRO™ Chicken Protein Isolate Powder is an incredible innovation for anyone looking for the most complete protein source containing all the essential and non-essential amino acids necessary for lean muscle recovery, strength, and overall health. There are many quality protein sources today, but chicken protein has always been the #1 “gold standard” choice. However, chicken has traditionally taken a lot of time to prepare, by baking, broiling, grilling, boiling, or steaming. I know this all too well firsthand. In my IFBB competitive days, I used to eat six pounds of steamed chicken a day—just over 40 pounds a week. That’s about 10 large chicken breasts a day, in addition to 18 egg whites and a couple of soy protein isolate shakes required to hit my protein numbers of 375-400 grams per day. Just eating six to eight protein meals a day is a job, but it’s necessary if you want to accomplish your goals in bodybuilding. Honestly, I wish CHiKPRO™ had been available then, to deliver the chicken-protein benefits I needed, without all the work. I retired from competitive bodybuilding 12 years ago, but protein is still a big part of my daily diet. I try to get in 200-220 grams a day to keep fit. CHiKPRO™ is already providing me not only great new convenience but the nutrition numbers I want. 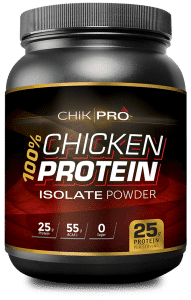 CHiKPRO™ Chicken Protein Isolate Powder provides the power of chicken protein not only for bodybuilders, athletes, and fitness enthusiasts, but for health-conscious, individual day-to-day dieters. It’s a fact that your diet counts for 80 percent of your results, and for muscle and strength athletes, protein is key at 30-50 percent of the daily diet—sometimes even more! This new high-quality, convenient protein source is ideal for all kinds of fortified products, including gravies, sauces, soups, snacks, and drinks that will let athletes take our nutritional arsenal—and our everyday enjoyment—to a new level while improving our results at the gym. You’ll notice that CHiKPRO™ is well suited for savory flavors that athletes are craving after years of “me-too” sweet-flavored protein drinks and bars. Yet it’s just as enjoyable and nutritious in more conventional supplement forms, like the Chocolate Caramel and Vanilla Bean shakes hitting the market now. Just imagine the possibilities—and watch for CHiKPRO™ Chicken Protein Isolate Powder, coming soon to your favorite supplement brands!